There are more than 100 different types of brain tumour, depending on which cells within the brain are involved. 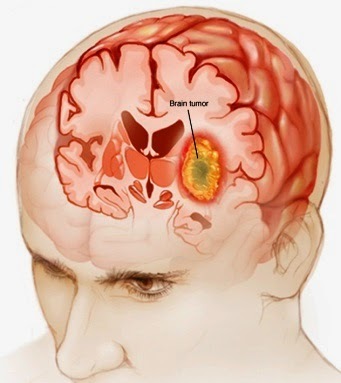 The most common (about 50 per cent of brain cancers) is called a glioma, and it is formed not from the nerve cells of the brain but the glial cells, which support those nerves. The most aggressive form of glioma is known as a glioblastoma multiforme – these tumours form branches like a tree reaching out through the brain, and can be impossible to completely remove. Meningiomas - which account for about a quarter and are formed from cells in the membranes or meninges which cover the brain. Pituitary adenomas - tumours of the hormone producing pituitary gland. Acoustic neuromas - typically slow growing tumours of the hearing nerve often found in older people. Craniopharyngioma and Ependymomas - often found in younger people. The treatment and outlook for these different brain tumours varies hugely. Some, such as meningiomas and pituitary tumours are usually (but not always) benign, which means they don’t spread through the brain or elsewhere in the body - however they can still cause problems as they expand within the bony box of the skull, compressing vital parts of the brain. Other types of brain cancer are malignant, spreading through the tissues and returning after treatment. Brain tumours are also graded in terms of how aggressive, abnormal or fast growing the cells are. Exactly where the tumour forms is also critical as some areas of the brain are much easier to operate on than othes, where important structures are packed closely together. Age - different tumours tend to occur at different ages. About 300 children are diagnosed with brain tumours every year and these are often a type called Primitive Neuroectodermal Tumours (PNETs) which have formed from very basic cells left behind by the developing embryo. PNETs usually develop at the back of the brain in the cerebellum. Genetics - as many as five per cent of brain tumours occur as part of an inherited condition, such as neurofibromatosis. Exposure to ionising radiation - such as radiotherapy treatment at a young age. Altered immunity - a weakened immunity has been linked to a type of tumour called a lymphoma, while auto-immune disease and allergy seem to slightly reduce the risk of brain tumours. Environmental pollutants - many people worry that chemicals in the environment (such as from rubber, petrol and many manufacturing industries) can increase the risk of brain cancers but research has so far failed to prove a link with any degree of certainty. Neither is there clear and irrefutable evidence for risk from mobile phones, electricity power lines or viral infections although research is ongoing to check these. In order to test a sample of the brain cancer cells it’s often necessary to carry out a biopsy of the brain. A small amount of tissue is removed to study in the laboratory (this may be done at the start of an operation to remove the tumour). Alternatively a lumbar puncture may be carried out. Those caused by damage or disruption of particular nerves or areas of the brain – symptoms will depend on the location of the tumour . There may be weakness or tremor of certain parts of the body, difficulty writing, drawing or walking, changes in vision or other senses, changes in mood, behaviour or mental abilities, and many other different problems. Those caused by increased pressure within the skull – these are general to many types of tumour. They include headache (typically occurring on waking or getting up) irritability, nausea and vomiting, seizures, drowsiness or coma. The type of treatment offered, and the likely response depends on the type, grade and location of the tumour. Unlike many other organs, it’s very difficult to remove parts of the brain without causing massive disruption to the control of body functions, so a cancer near a vital part of the brain may be particularly difficult to remove. Surgery - to remove all or part of the tumour, or reduce pressure within the skull. Radiotherapy - some brain cancers are sensitive to radiotherapy. Newer treatments (stereotactic radiotherapy and radiosurgery) carefully target maximum doses to small areas of the tumour, avoiding healthy brain tissue. Chemotherapy - these treatments are limited by the fact that many drugs cannot pass from the blood stream into brain tissues because of what is known as the “blood-brain barrier”, but may be useful when tumours are difficult to operate on, or have advanced or returned. Newer "biological" therapies - for example, drugs which block the chemicals that stimulate growth of tumour cells. Steroids - these can help to reduce swelling of the brain and decrease pressure in the skull. Treatments do continue to improve - for example, survival rates for young children have doubled over the past few decades, and many new developments are being tested.